We get asked all of the time for the ‘magic’ brush. Sadly, there is no such thing, though there are certainly plenty of options available. 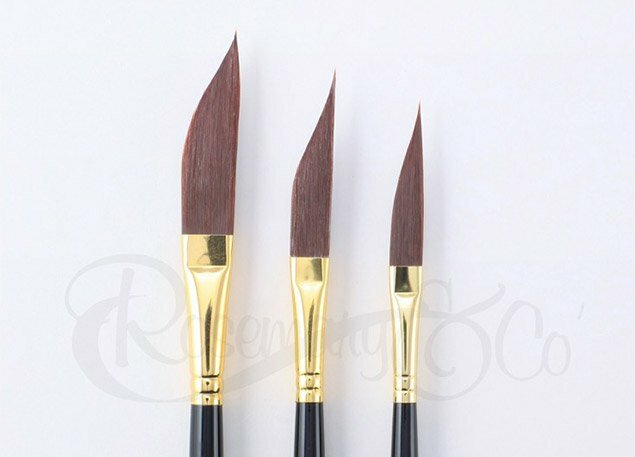 And although it’s difficult to recommend a brush to someone without knowing specifically what they are painting, here are some helpful guidelines I want to share. My first piece of advice would be to buy the best you can afford. I can’t tell you how much you will appreciate a good brush, once you get hold of one. You must remember that the brush should be an extension of your arm. The last thing you need is for the brush not to behave how you intended. Secondly, you need to decide what you need the brush to do. This may sound obvious, but very few people are able to use the same brush for their entire work. If you know that you need a brush for – blending or softening your edges, as an example – that’s a start. 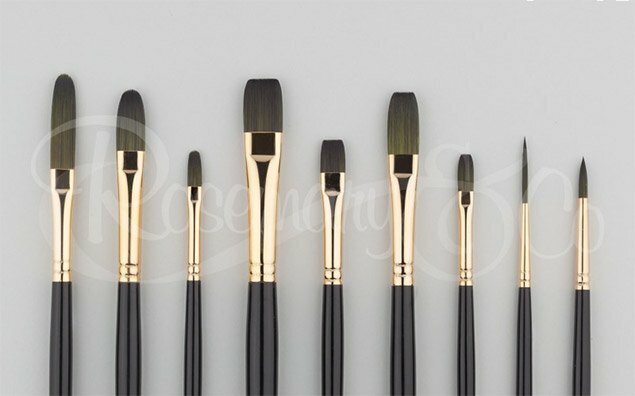 Below I’ll try and break down the different types of Oil brushes available, and what you should expect when using them. Another useful tip would be to figure out which handle length suits you best. Our shorter handles (also known as standard handles) are approximately 7 inches. The longer handles are approximately 11 inches, and are generally favoured by Oil artists as they allow better perspective. If you’re really daring, we do offer a 24 inch handle which is a technique old masters such as Sorolla adopted. It’s best to separate Oil brushes into Synthetic (fibres) and Natural (hair) when trying to explain the differences. 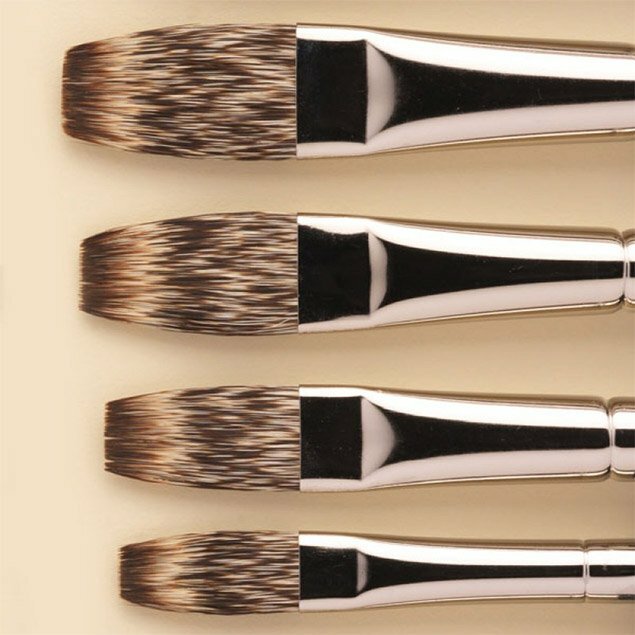 As an overall brush, Synthetics are all fairly easy to clean, withstand a good amount of abuse, and they are relatively inexpensive. It’s also important you should understand that synthetic fibres have come on in leaps and bounds over the past 10 years, like many other man-made products and so they no longer hold the taboo they once had. If you haven’t dared to try synthetics in the past because you thought they were ‘student’ grade, I urge you to reconsider. These are our most popular synthetic range for Oils. They come in lots of shapes and sizes, and are available on the shorter and longer handles. The Ivory fibres have been sandblasted with shards of glass, which make them firm, and wear down well. They clean really easily, and lost a lot longer than your average synthetics would. The Ivories will be a good work horse for you, and many of the leading artists all over the world consider these their go-to brushes. The Evergreen Synthetics are a newer range for Rosemary & Co. We developed these as a present for some of our ambassadors as few Christmases ago. They are literally the Ivory brushes dyed Green (for Christmas!). It’s quite remarkable how the dye completely changed the temperament of the brush. The Evergreen’s are slightly softer than the Ivories, but still have a good snap. I’d recommend trying one alongside an Ivory brush, you’ll feel the difference. Similarly, they clean well, withstand a good amount of abuse, and are inexpensive. The Eclipse Synthetics are a synthetic mongoose, which is designed to mimic the real thing. They have much more spring then their natural companion (the Masters Choice). They are softer than the Ivories, and the Evergreens. This fibre would be ideal for blending and softening work. They are particularly favoured amongst portrait artists too. The Eclipse have been dyed four times to look like the mongoose, and again, the dye does make them feel different than the other synthetics available. The Shiraz synthetics are ideal for Oils, Acrylics and Watercolours. This range has an excellent ‘snap’ and ‘spring’ to them, with paramount resilience and durability. They are extremely versatile which makes them ideal for use with any medium. Again, they are easy to clean, and hold their shape well. 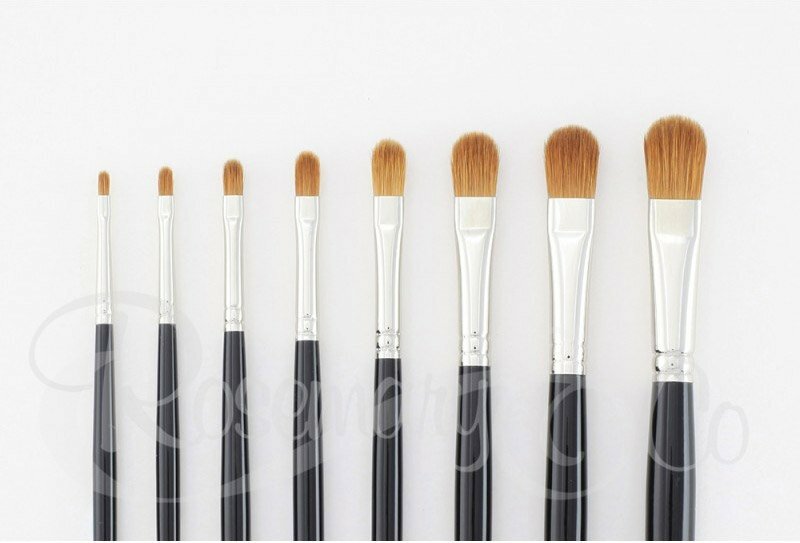 As a general rule Natural hair brushes are more expensive than the Synthetic brushes. They are also usually softer, and the hair will wear down more quickly with these. However, some of the marks you can gain from a natural hair brush just simply can’t be achieved with a synthetic brush. The Masters Choice brushes are our most popular natural hair brushes. They are a unique blend of badger hairs (once were the mongoose hair). They are absolutely brilliant for alla prima work, allowing you to work ‘wet on wet’ without pulling the paint away. The hair is responsive and firm, yet gives almost a velvet feel. They are ideal for adding highlights and tonal values. They are resilient, and will wear down well. The Pure Red Sable are a treat for Oil artists. They are a brilliant choice if flexibility is needed. You can get precision with the Red Sable, as well as it being a good blocking-in brush, particularly in the larger sizes. If you can afford to try the Sables, I can guarantee you will not be disappointed. The Ebony range is a blend of natural hairs, which closely mimic the Sable, just at a lower cost. They are a little unsung gem. Literally everyone I speak to who has tried these always asks why they are not more popular. I think the reason being, that we only offer them in a couple of shapes. We may work on other shapes if enough people ask for them. This range is strong enough to work with oil, but has a good softness for blending. I’m sure this range would become a favourite if you were try try them. We offer lots of different bristle brushes, however the Ultimate range is our newest addition. 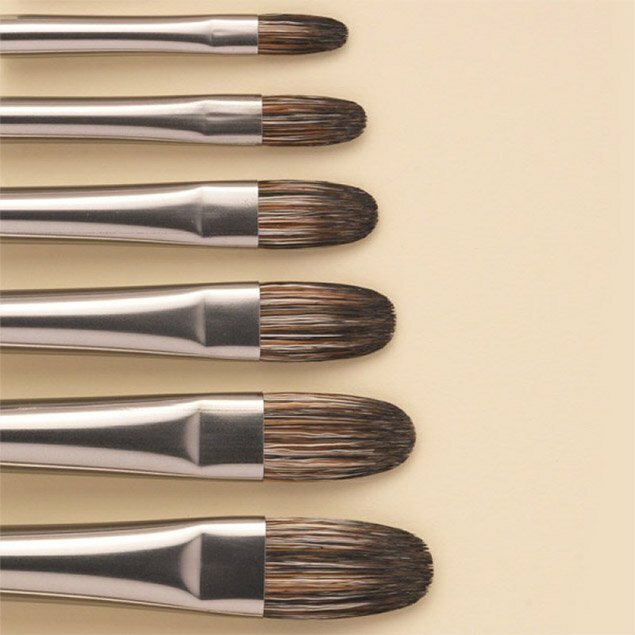 The interlocked bristle brushes offer the artist a traditional brush but with double the interlock. We take two equal amounts of best quality Chinese bristle and set them opposite each other so that the natural curve is facing inwards.The bristle is selected in length and size to enable perfect balance. Although labour intensive, this gives the artist a hard wearing brush which keeps its shape for a very long time. Easy to clean and a good performer. They are currently only available on long handles. The Classic Bristle is slightly different to the Ultimate Bristle. The Classic is a blend of 90% Bristle, 10% synthetic. This blend allows the bristle to clean easily, and wear down a little better. 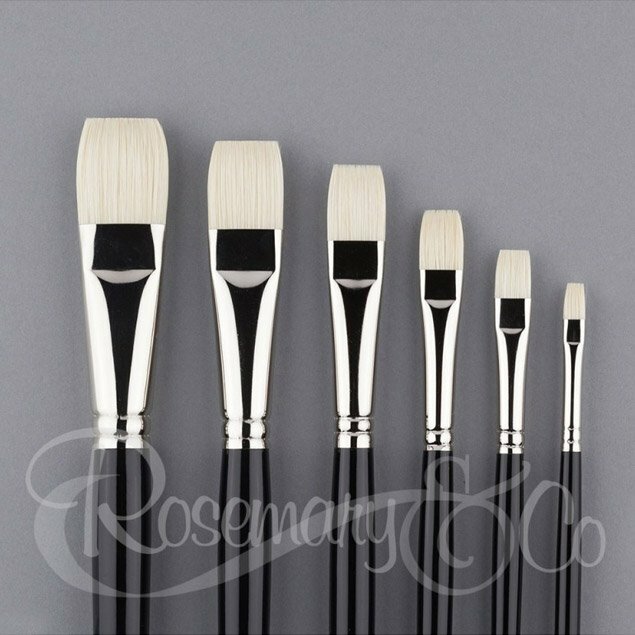 A long awaited range designed for the traditional oil painter who likes the feel of a bristle brush and the brush mark achieved but doesn’t like the durability and the way bristle can sometimes ‘splay’. This blend of bristle and strong synthetic is ‘interlocked’ allowing the brush to retain it’s original shape for much longer. I hope this has been insightful to break the ranges down. There are lots more I could have talked about, but I think the above are really key for getting to know the differences. Recently I made up two assortment sets which give a taster into the different ranges. They are a good set if you want to try the different hairs and fibres but the same shape. You can view these sets on our website. And finally, there’s cleaning your Oil brushes. For now, all I will say is make sure you do clean them well. There’s a lot of advice out there (and maybe people would like me to write a post about that some time too?). It seems such a shame, and a waste of hard earned money, to have such beautiful brushes and be hindered by the fact they’re not cleaned properly. If you ever need some more help or advice, know that we are a small company and we are real people. 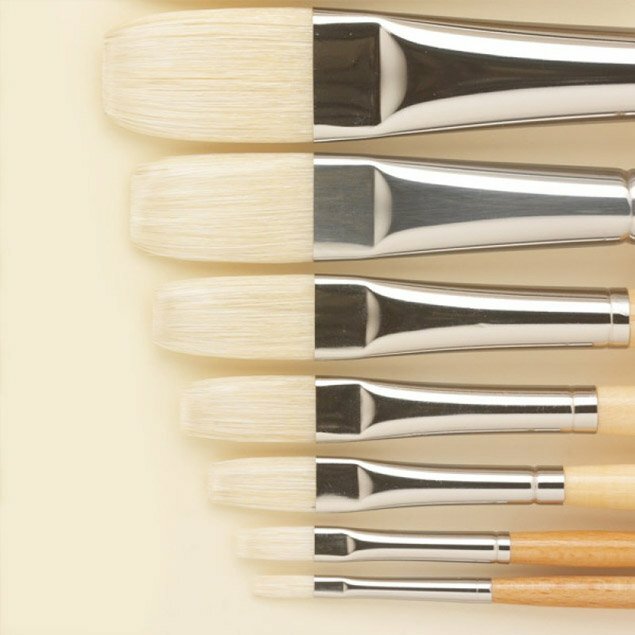 I’m always there to try and answer any questions you may have about brushes. I’d like to sign off this post by offering you a free mail order catalogue. 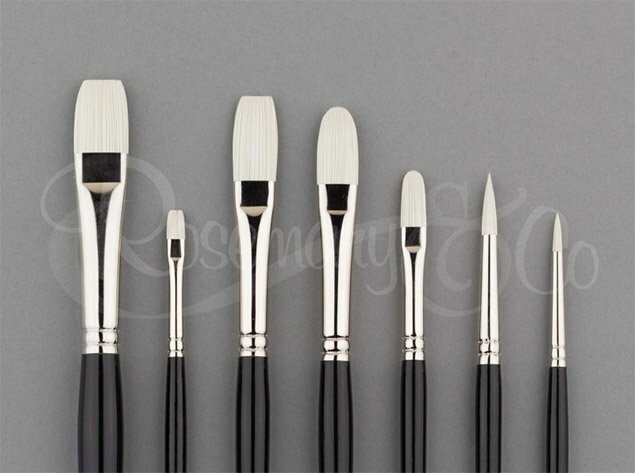 In there, all of the brushes have been photographed actual size. That’s really useful since there’s no universal brush size across the different companies, sadly. There’s also heaps of information in there should you wish to know more. I just purchased some filberts and flats from the Ivory collection. I love them. The way they load and lay the paint is wonderful and they hold their shape beautifully. I wish that I had discovered them sooner. I would like to be on your email list for any promotions and new products . I purchased a few brushes at a Monterey plein-air event and love the brushes for my work. I need to go on your website soon and order more . Thanks for the information in your article . Your customer service is above par from what I hear from so many artists . Good info for sure….my fav are the Master and Ivorys, but I have a few of the Sable too!! Have some Evergreen, but have not tried them yet, will do. Loved the green!! I’ve been using something called “Art Wash” for years to clean my brushes. I think it’s now called SoySolv. It’s made from soy beans and is non-toxic. Hi Symi and Rosemary. I’d like a catalogue please. Also info about the Mundy Mops. If it’s in catalogue or on website never mind. PS We met in Scottsdale. I’m one of Stephanie’s student when she had her studio in Tucson. I’d like a catalogue please. Also info on Mundy Mops if not in catalogue. PS Met you in Scottsdale. I’m one of Stephanie’s ex students from her Tucson studio days. Es notable la excelencia de sus productos y me gusta esta manera de presentarlos a sus seguidores.